Over the past couple of weeks i have been watching a series of TV documentaries called "Ancient Aliens 2012". This series delves into the ancient civilisations of the Mayans, Egyptians and Sumerian cultures. They also delve into the possibility that these ancient cultures were perhaps far more advanced then we were, what we have now we have only just scratched the surface compared to what the Sumerians and other ancients had thousands of years ago. Some of these discussions included the possibility that these civilisations may have had extrarerrestrial influence which would not suprise me at some of the ancient ruins such as stone henge in my country and the ancient pyramids in Egypt. These stones weighed tons and it would have been impossible for workers or the so called "Slaves" of Egypt to have holstered these stones which weighed tons onto other stones it would be impossible even for thousands of workers. One of the episodes intrigued me a lot, Ancient Aliens 2012: The Evidence, as i was wathcing the episode i came to a part known as the Iraqi Battery in which this battery was thousands of years old, they tested the theory that the ancients had electricity. I tried to test this theory myself with a simple clay pot, the necessary metals and normal vinegar, when the acids interacted wth the metals it produced an electrical charge as seen on the experiment in the episode i watched at the time. I was amazed at this and could not believe my eyes at how powerful this batter was. This series of shows has certainly opended my eyes and i do agree with some of the people being interviewed there was extra-terrestrial influence on these ancient civilisations. I know one race of aliens which have influenced the sumerians they are called "The Annunaki" This is the most common of all the extraterrestrials which may have had influenced all ancient races of the time. These people in my eyes were the race responsible for mans creation and them wanting us to have our own culture on a world which in my eyes is full of life and this planet we live on is so beautiful, and it gets me thinking why do we have to keep battling eachother because it is our nature. I would highly recomend watching this series of shows it wuold deffinately open peoples eyes as to whats these ancient civilisations were really like and that these civilisations were not primitive as most people think. As i stated now the technology we have now we have barely scratched the surface as to what these ancients had. I highly reocmmend watching these shows. I've been wondering lately if the asteroids falling into Russian territory such as the Chelyabinsk meteor on February 15th have any connection with the cauldron "defense system" in the Yakutia region. It's said that this also connects with the Tunguska event. I finally caught a marathon this past Friday, although I only caught the last two hours of it. I hate that the show has been moved to H2 though. Like a lot of people, I can't justify paying the extra money per month just to get that one channel. I watch what I can find on Amazon Prime and anywhere else it is hosted online for free. Could it be that it only appears that ancient civs had superior technology because they inherited access to some advanced technologies of the Anunnaki? Like monkeys with an atom bomb, they didn't know how it worked, just that it scared the heck out of people. 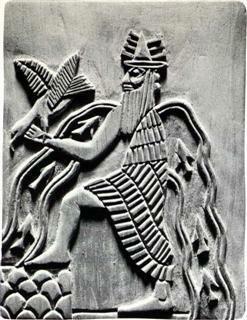 If you read the entire writings about the Annunaki it really explains how we could draw the conclusions that we have. I really liked the part where Marduk was locked inside the Great Pyramid by Innana (the original Goddess of Love). Getting him out was what ruined the GP's function and the "equipment" was removed to another location. Dumuzi and Innana were the original Romeo and Juliet. I just wanted to add that if you read "Giza Power Plant" by Christopher Dunne, he explains what that "equipment" might have been. Interesting how he theorized about the GP having this equipment in it. I wonder if he had read the Sumerian texts before he wrote that. If not then it is a tantalizing coincidence, huh? Nah, the pyramids were just burial chambers. Burial chambers that were never used as burial chambers, despite all the expense and time to build them. Right. I've been watching that show with fascination !!! I am hoping that they do something with a tie in 2 Atlantis at some point.